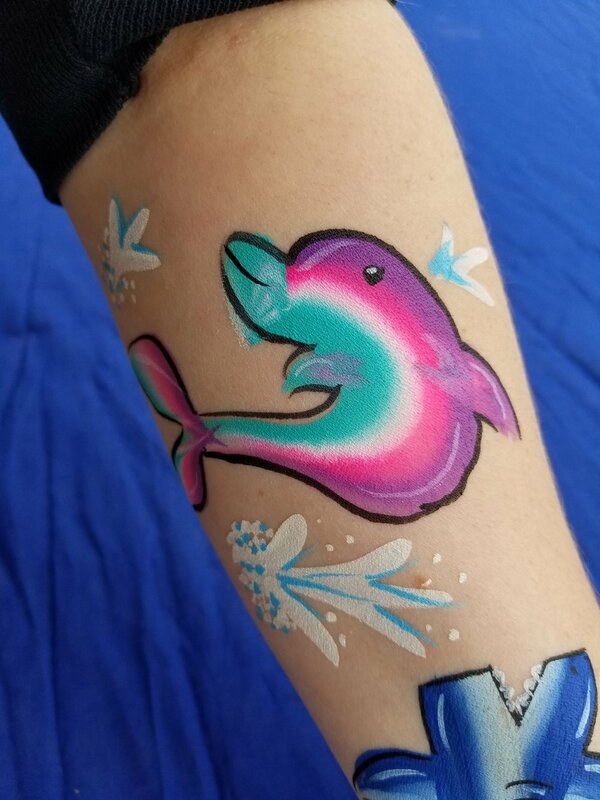 The carnival, county fair, and street fair classic option with bright face painting colors and popular child-friendly designs. Children LOVE to see their friends and themselves transformed in to their favorite super heroes, comic book characters, animals, princesses, and more! 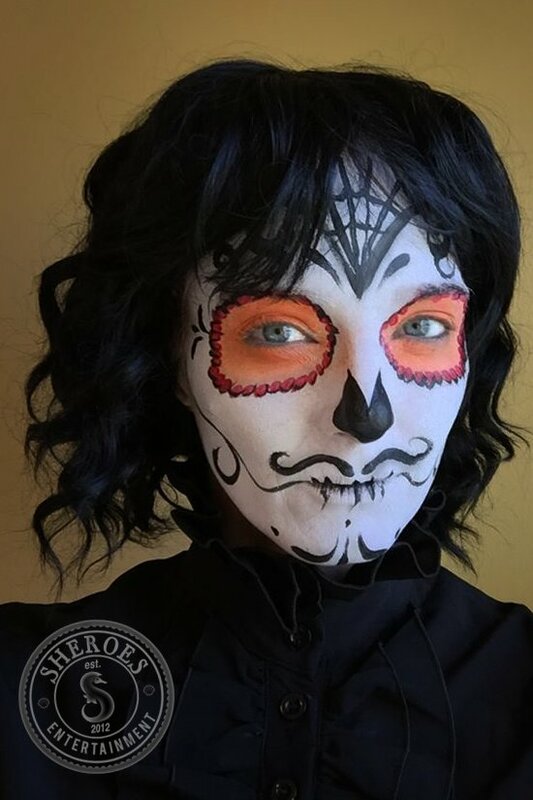 Carnival style face painting can be taken in a Halloween-specific direction with face painters specializing in Dia de los Muertos skulls (sugar skulls), vampires, and zombies for adult parties on or near Halloween. 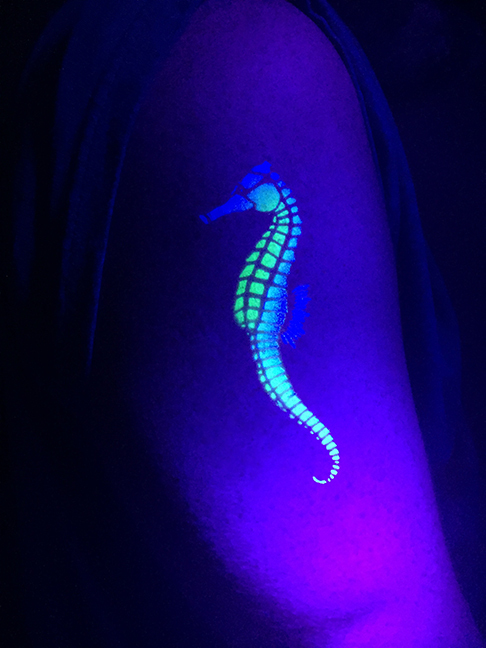 NON UV reactive face paint suitable for outdoor or indoor parties. Does NOT glow. 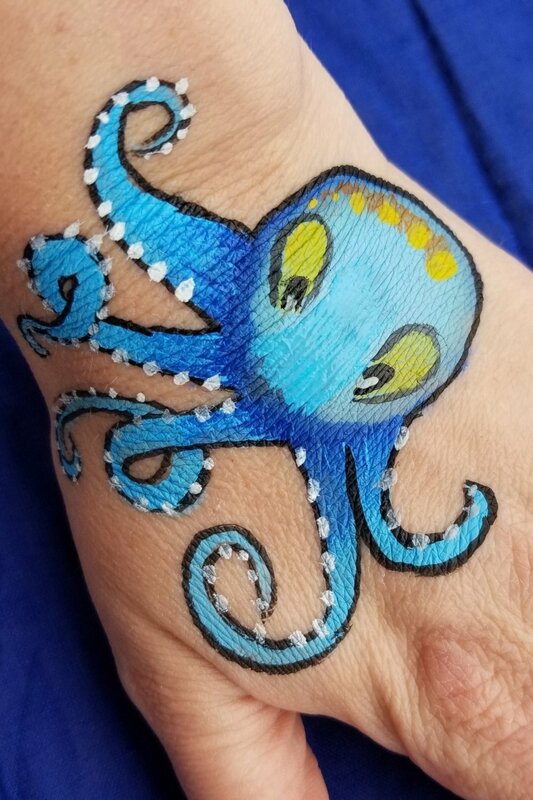 These traditional carnival-style face painters in Ventura County, Sacramento, and Los Angeles are a must-have for a classically fun birthday party or community event. 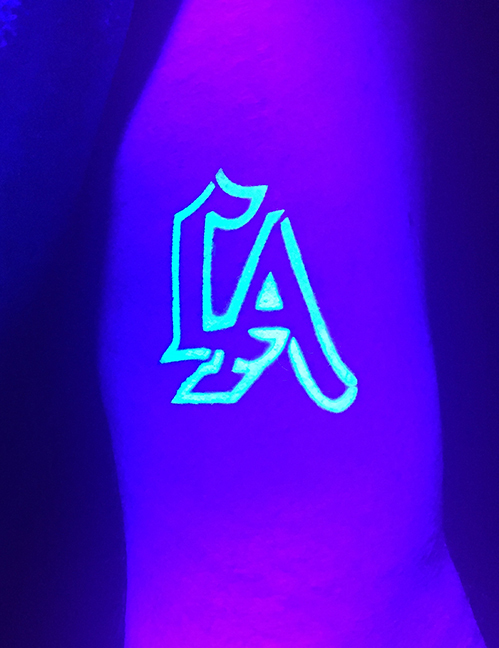 Blacklight / UV Style Arm Art is Popular in Los Angeles! 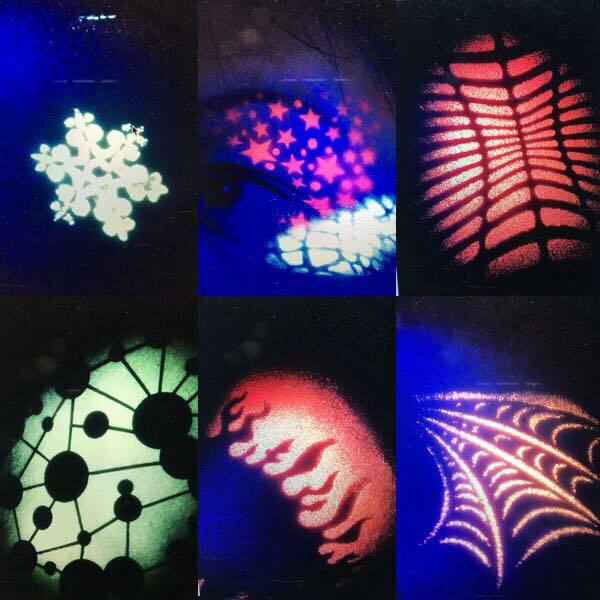 A night club, trade show, corporate cocktail party, teen, glow party, Star Wars, haunted houses, dance party, laser tag party, and neon party top face painting choice for guests who want to SHINE! 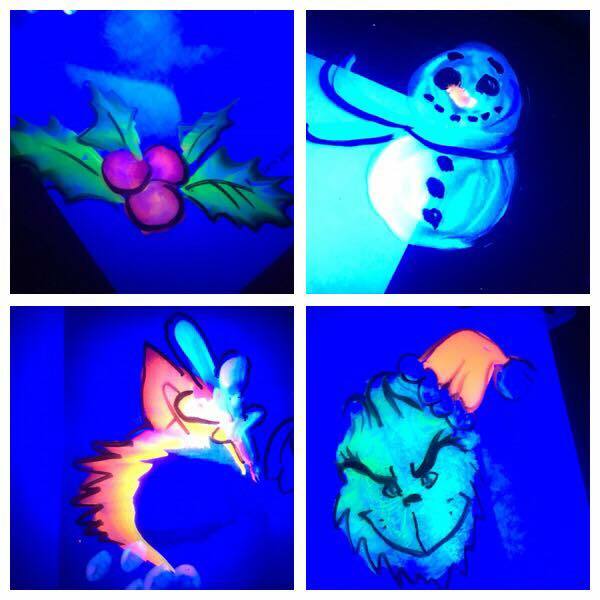 UV Black Light face painting is strictly neon in range and is specially made for being UV-reactive under blacklights. 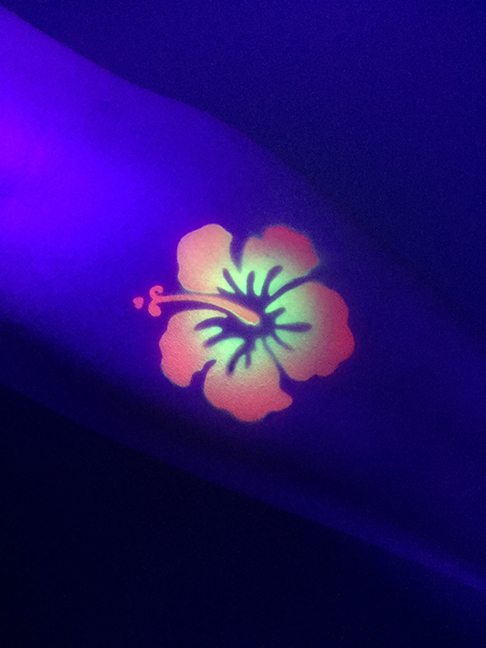 UV face painting does NOT glow on its own, under normal light the face paint appears neon and needs the presence of blacklights to really come to life. Better Together: Glitter & Face Paint! You are welcome to mix and match our face painting and glitter body art services at the same party at no additional charge. 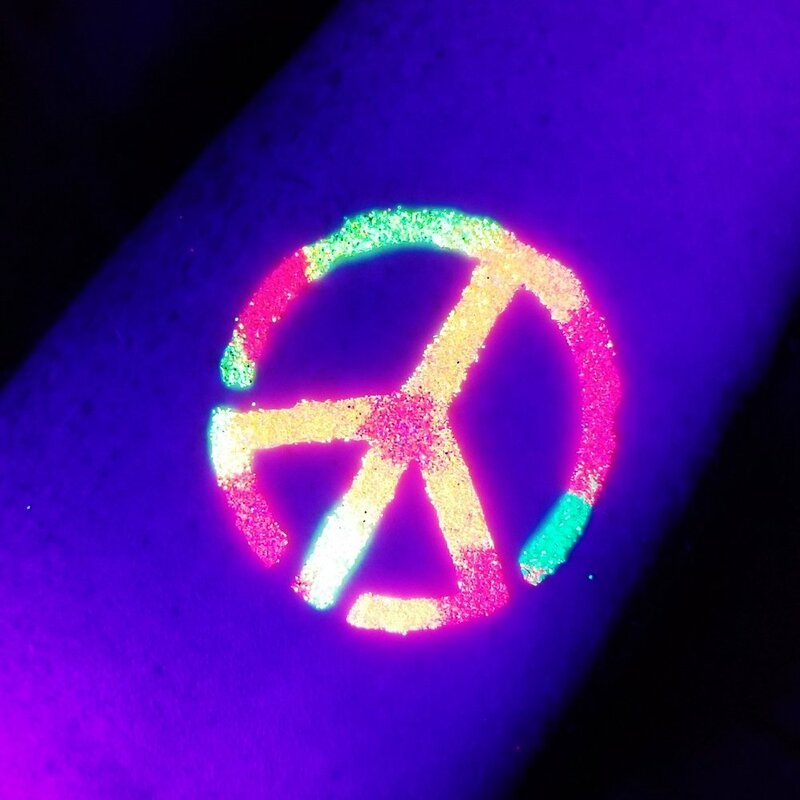 Here are examples of both standard carnival-style glitter body art and UV/blacklight glitter body art. Our party packages start at $165 per hour, 2 hour minimum, and are based on location and time duration. We can accommodate up to 34 guests in 2 hours of time per painter. Face and body painting design times vary based on complexity, e.g. a full intricate Day of the Dead skull can take up to 15 minutes per person while a simpler Batman design only takes 3-4 minutes. On average a simple design takes 3-4 minutes PER PERSON. If you are expecting a larger crowd please add on additional face painters. Six painters were able to work with between 600 corporate event guests over 4 hours with this optimally designed layout (photo of white table with tall chairs). Southern California including Los Angeles (inc. Hollywood, Pasadena, Glendale, Burbank, Porter Ranch, Northridge, Culver City, Woodland Hills, West Hills, Granada Hills, San Fernando Valley, Valley Village, Sepulveda, Mulholland, Coldwater Canyon, Encino, Hidden Hills, Hidden Valley, Universal City, Citywalk, Brentwood, USC, UCLA, CSUN, La Canada Flintridge, Monrovia, Arcadia, Topanga, Century City, Pasadena, Silverlake, North Hollywood, West Hollywood, Bel Aire, Beverly Hills, Calabasas, Agoura Hills), Ventura County (inc. Moorpark, Simi Valley, Camarillo, Thousand Oaks, Ojai, Newbury Park, Westlake Village, Lost Hills, Lake Sherwood, Oak Park, Ventura, Oxnard, Port Hueneme, Point Mugu, Fillmore, Piru, Saticoy, Conejo Valley), Sacramento and surrounding Northern California areas. No proper princess is dressed without a crown and matching face paint jewelry. Amazing options for both boys and girls. Fairies and butterfly masks are face paint favorites with girls all year long! Yes! We only use FDA approved super fine cosmetic grade glitters, face paint, and cosmetic glues in our party and event services. We recommend using any major waterproof makeup remover such as Neutrogena Wet Wipes to remove your wearable face paint or glitter accents. In the event that minor skin discoloration occurs please apply your favorite face-safe lotion and let it sit; most remaining pigment will disappear within 24 hours. Please let us know if you are having a specific party theme when you make your reservation. We can often prepare theme-specific options with advanced notice. What is Black Light Face Paint? 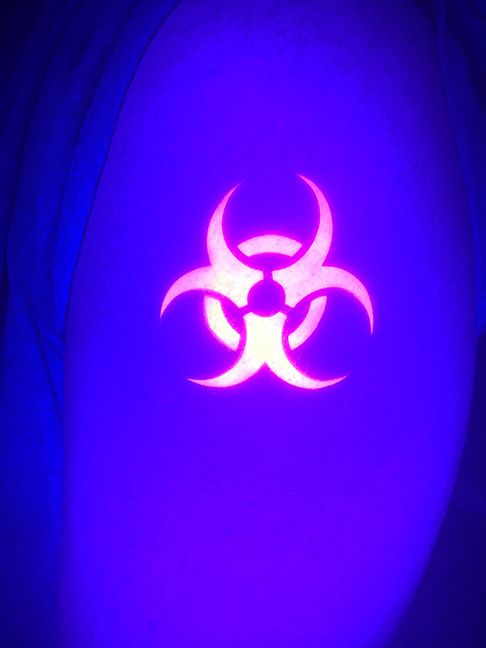 A black light, also referred to as a UV-A light, Wood's light, or simply ultraviolet light, is a violet filter colored lamp that emits long wave (UV-A) ultraviolet light and not much visible light. 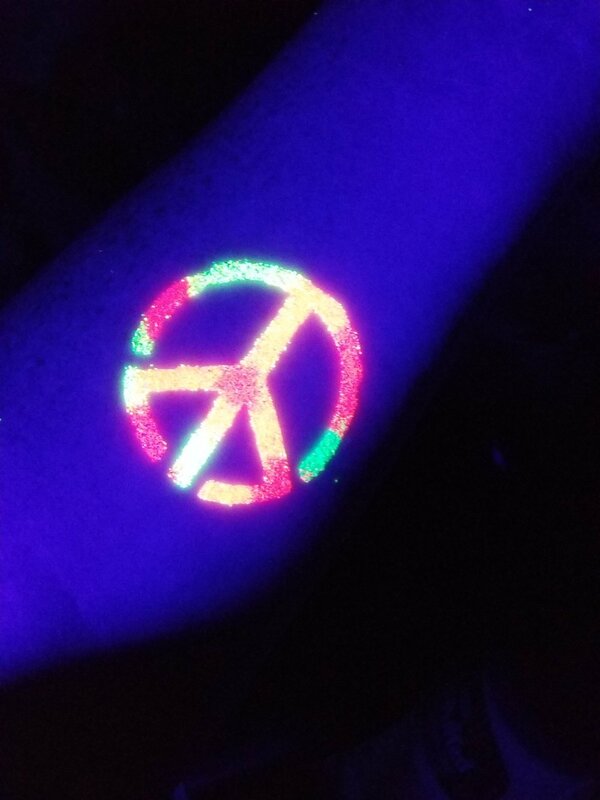 Black light face paint is a special neon colored face paint that is expressly designed to glow brightly under that type of light. Black light neon face paint is NOT the same as glow in the dark face paint. It appears lightly colored and watery under normal sunlight and does not glow by itself. Under the black light these special neon colored face paints come "alive" to the eye and glows brightly. 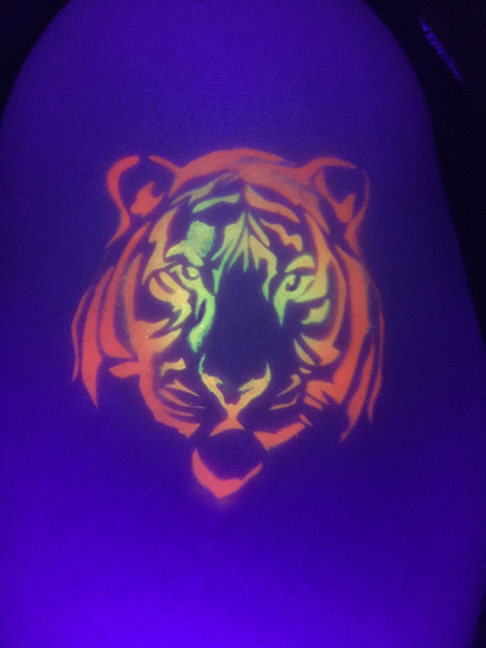 You MUST have a black light for black light face paint to be visible at dark. Our professional face painters arrive in our company shirt and tidy pants or skirt unless otherwise requested. What kinds of designs can they do? Our carnival-style face painters can do children's face paint party designs based on things like: fairies, princesses, pirates, snakes, super heroes, super heroines, unicorns, Frozen themed color designs, dolphins, dragons, butterflies, cartoon characters, monsters, tigers, dogs, cats, clowns, mermaids, masquerade masks, flower child, Hawaiian flowers, crowns, fake tattoos, and more! 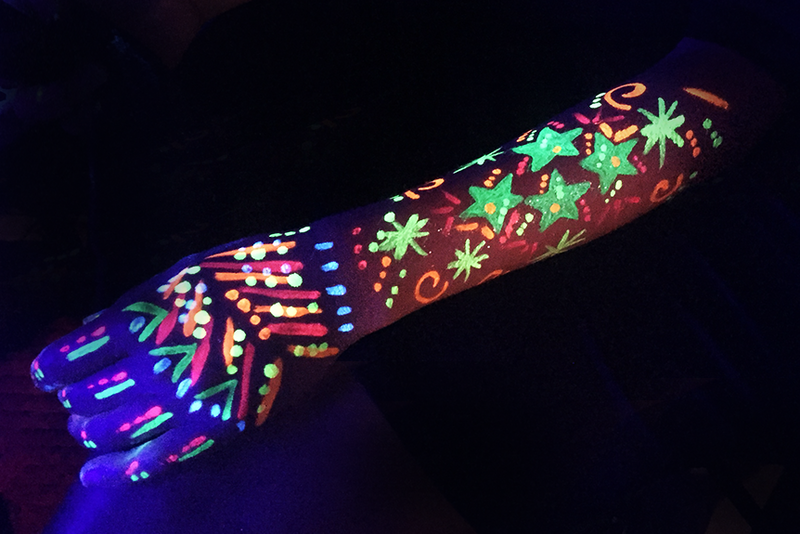 Our UV-style face painters work with texture, contrast, organic designs, floral designs, tribal art, and BoHo / Burning Man style requests. We've been appalled while reading professional news from around the country to hear that cheap store bought brands are putting lead and caustic materials that brand skin in to their products. 100% of our face paint, body paint, and glitter kit materials are FDA approved* for cosmetic use. 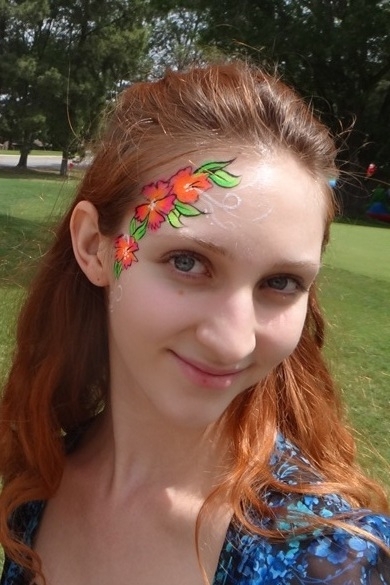 Teens and adults have options too - we offer pretty face paint flower designs to accent faces, hands, or arms. We will only face paint consenting individuals, a child must give their consent to be painted. Many 2-4 year old children will prefer a hand art design that they can look at instead of a face paint design. We will not paint over open wounds, sores, or broken skin. We will not paint over any rashes or on individuals who have signs of eye or skin infections. We will not paint near a nose, mouth, or eyes on any individual who appears to be sick or recently have been sick. 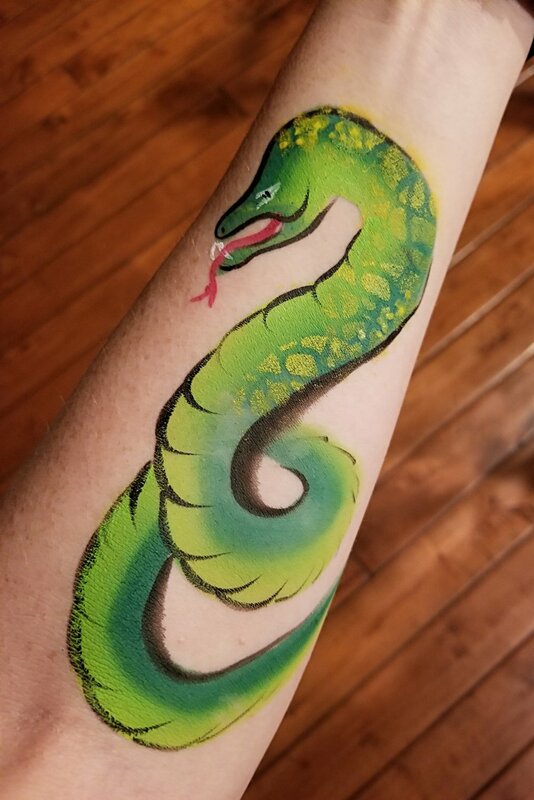 Our face painters reserve the right to decline to paint any symbols, words, or on any body parts that they are uncomfortable with for any reason and at any time. Guests are not allowed to paint themselves or touch face paint kit contents. * FDA approval excludes UV black light face paint which is professional cosmetic grade. 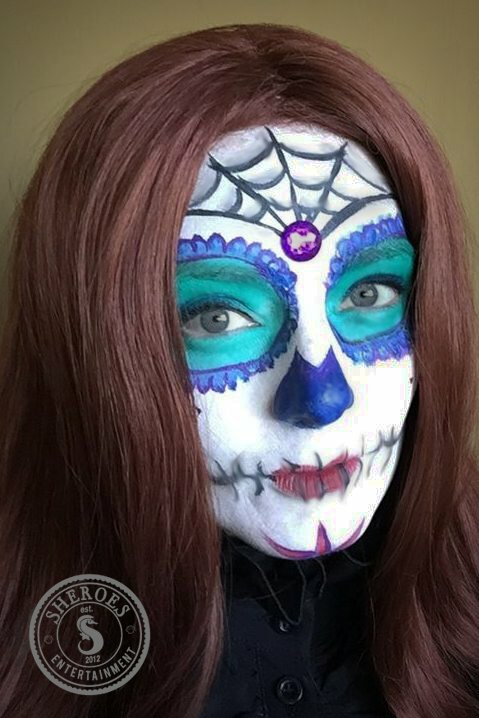 Super hero face paint designs make every kid feel like a champion!